Unlike roast chicken, for which I have no fewer than twelve favourite recipes, I genuinely thought I had salmon all sewn up. Completely satisfied with my fail safe method of cooking a whole side of fish to feed a crowd (and then to be be used in a few midweek meals) there was no need to look any further. But on several middle-of-the-night-surfing exercises, Alison Roman’s famous Slow Roasted Salmon that first featured in Bon Apetit kept popping up. While lauded all over the internet, my skepticism kicked in around the benefits of cooking a naturally oily fish with a relatively large amount of olive oil and at a low temperature. So in all my ignorance, I skipped past the recipe, never attempting to see what all the fuss was about. And then, Dining In, Alison’s new book hit the proverbial shelves of that famous internet bookshop, and landed on my front door mat. With, yes, a simplified version of her acclaimed recipe. I relented. I made the low and slow salmon and there is no looking back. I am not giving up on my old trusted favourite recipebut I have made this more than a few times in the past few weeks. For anyone who also thinks they have found salmon nirvana, I invite you to add this one to your repertoire. Just to shake things up a little. Do not balk at the amount of oil in this recipe. It keeps the fish ridiculously moist, and if you serve the fish at room temperature as part of a salad, it will act as the built in dressing. I like to make this fish in a snug fitting ceramic dish, and then roughly break it up back into the dish to serve soaking up the citrussy oil covered with herbs. 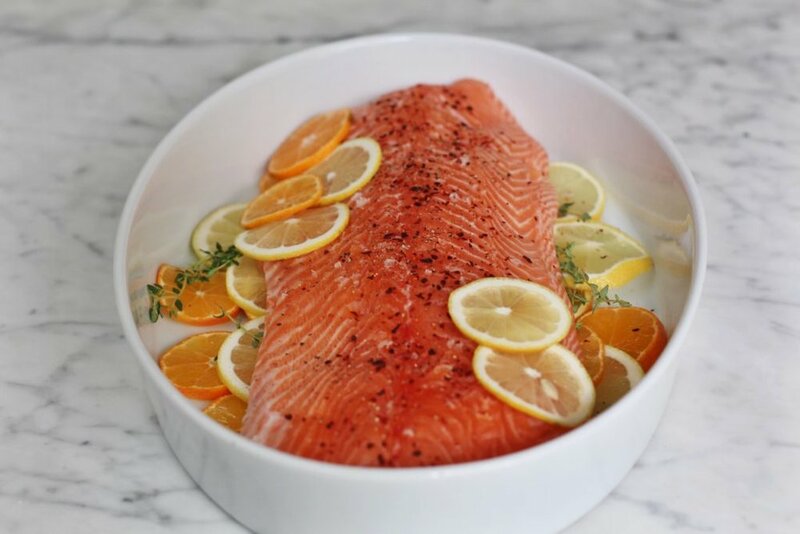 If you don't have a ceramic dish to suit, use a rimmed baking sheet, but you may need to increase the oil amount so that the fish is almost halfway submerged. Feel free to add fennel, freshly sliced or dried chilies, fresh herbs or any other flavour base of choice to permeate through the oil while the fish cooks. I always make a whole side of salmon, as this makes superb leftovers. But if you want to make it for 4-6 people, reduce the oil to 180-250ml depending on the size of your dish. Season salmon well with salt (I use Malden) and pepper on both sides and place on top of the aromatics. Drizzle the olive oil over everything and put it in the oven. Cook until the salmon is just opaque and still slightly pink inside 25-35 minutes depending on the size of your fish and your baking dish. I like to serve this salmon broken up into large pieces and tossed back into the citrussy oil and topped with torn herbs.